We all met at LAX for our flight to La Paz, Mexico. Seven of us stood around waiting for the flight (Russ Hampton, Bill Taylor, Hugh Agar, Rocky Tussey, Lynn Adams, Pete Kalbakas and Tom Agar) and swapping fish stories in anticipation of the fishing trip. The flight was easy; it lasted just over two hours. When we arrived in La Paz, we had to go thru the customary procedures with Mexican Immigration and Customs which went relatively easily. We were then met by Manny our Van driver who would drive us to our accommodations about an hour south of La Paz. After we loaded up the Van with our fishing gear and personal stuff we headed off to the village of Ventana. About 15 minutes into the trip we stopped at a Wal-Mart for any last minute items needed for the trip. 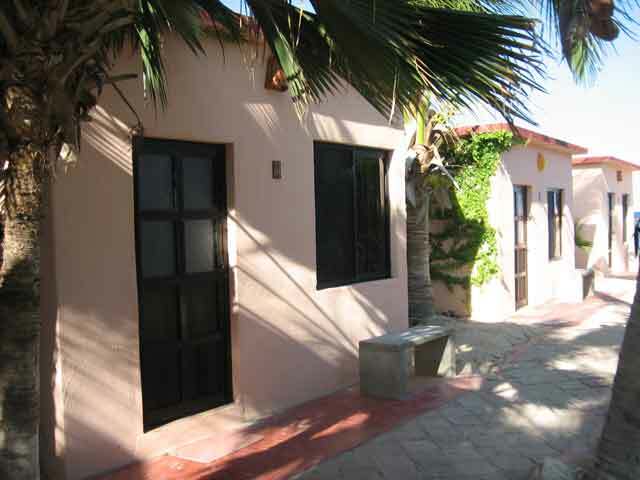 When we reached Ventana we turned off onto a small dirt road that took us into Baja Joe’s, our base camp for the trip. 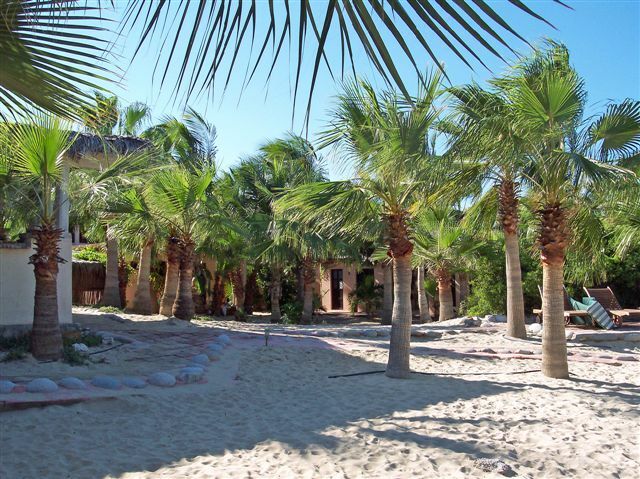 Baja Joe’s is located ( http://www.bajajoe.com ) right on the beach in Ventana, Mexico. Gary Bulla ( http://www.garybulla.com ) our host and all around guide greeted us and directed us to our rooms. After we unpacked, we all met on the veranda overlooking the Sea of Cortez, where Gary introduced us to Joe and Angie the proprietors of Baja Joe’s. 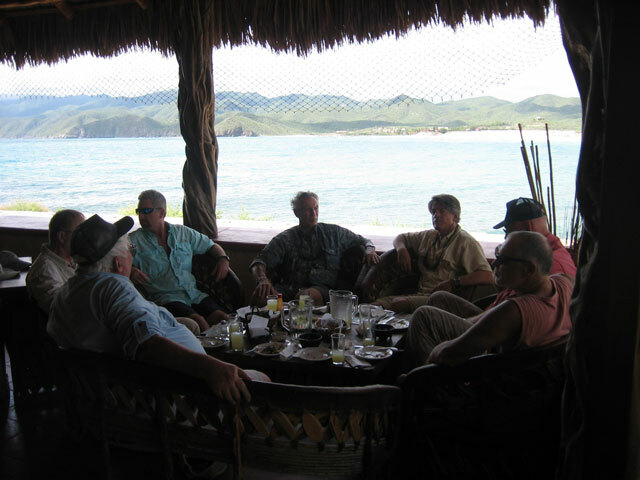 We all sat around a large dining table drinking some cold ones while Gary briefed us on what our itinerary was and what to anticipate in these fishing waters. Russ assigned us our fishing partner’s and our boat captain. We were going to change partners and boat captains each day so that we could have the best fishing experience possible. Later that evening, Joe and Angie provided us with a great dinner and good conversation and sent us off for a good night’s sleep in preparation for the next morning events. The next morning we woke at 4:45 AM got our gear ready and were provided with a great breakfast consisting of fruit juice, fresh fruit plate, cereal, scrambled eggs, sausage, English muffins and coffee. After breakfast we packed our ice chests with our lunch for ourselves and boat captain. Gary had a large Van and a Suburban ready to take us the boats. We loaded the vehicles up with our lunch and fishing gear and left for the boats at 6:00 AM. It was a short ride to the boat launching area which was a cove located near the old hotel at Los Arenas. It was still dark when we arrived; sunrise would not be until closer to 7:00 AM. We could barely make out our boats that were on the beach waiting for us. 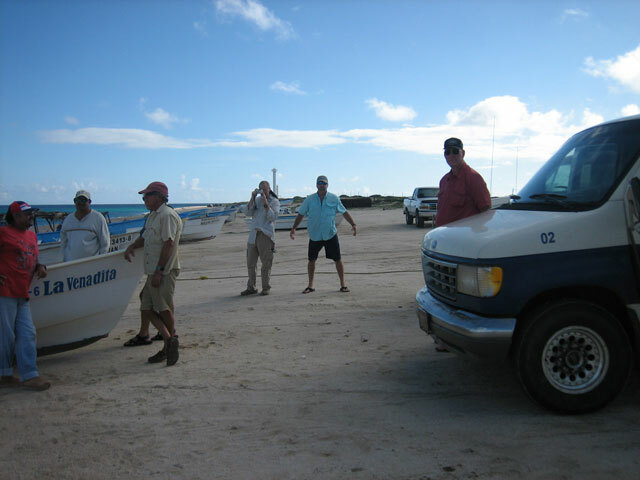 The captains helped us load the boats with our gear and we helped each other launch the boats from the beach. We had five boats that were part of our group. Four carried the fishing partners and one caught the live bait for the whole group. The bait boat was normally launched first about fifteen minutes before the rest of us so that they could get some bait on board and be ready for the rest of us after we launched. We would rendezvous with bait boat, fill up the bait tank and then head in the direction that we were going to fish that day. On the first day, the waters were relatively flat with little or no wind and it was slightly overcast. Our boats headed towards Cerralvo Island where our first fishing day would begin. We had our lines in the water around 7:00 am just about 50 yards off of the island. It did not take long for two or three of us to have fish on. 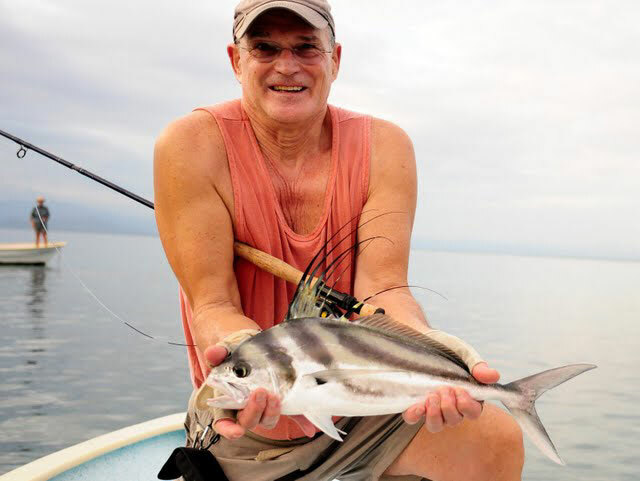 Bill Taylor (club member) was fishing with Gary Bulla and already had a couple of strikes when he hooked up with a 3 lb Rooster Fish that was taking him in all directions. 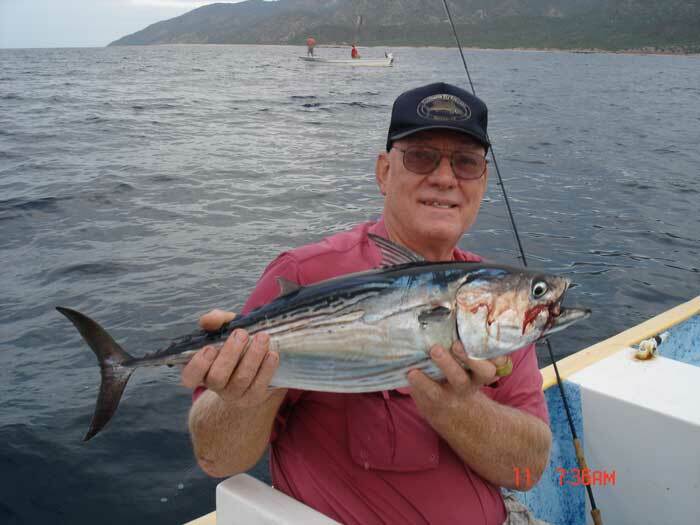 It turned out to be great first day for Bill who caught a Baja Grand Slam (Tuna, Skipjack, Dorado, Rooster and Jack Cravelle). That first day was something special in that all of us hooked up with what we initially thought were good sized Tuna which turned out to be humongous Skipjack that were all above 15 lbs with a good many near 25 lbs. 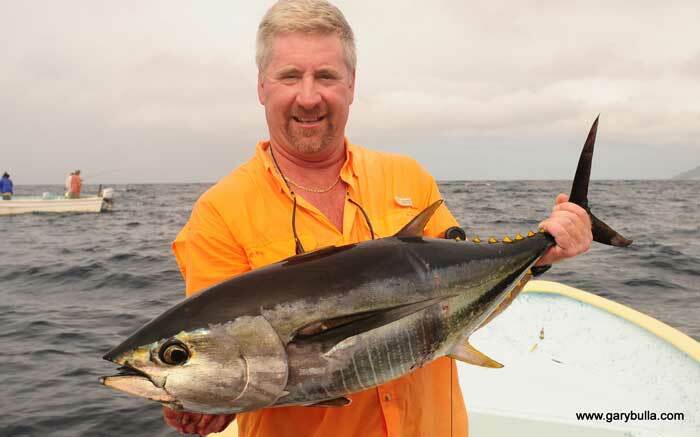 If fact, Lynn Adams could not stop hooking large Skipjack each time hoping it was a Yellowfin. After he had caught three or four of them in a row, I heard him yell out "Not another of them &%$#**#@$ %$^^&* skipjack". In any case, later that morning we all got into Dorado which averaged 8 to 10 lbs with some nearing 15 lbs. That evening the tequila flowed and the large plates of tuna sashimi were passed around as we helped celebrate Bill Taylor’s slam. Angie our host provided us with a great fresh Dorado dinner from that day’s catch. The next day, we woke up to the news that a storm was on its way to the Baja and the winds might pick up later that afternoon. After another hearty breakfast we left for the boats in anticipation of another great day. The boats had moved to another beach a few miles north of their original location and a little more sheltered from the wind. We loaded our gear on the boats and launched. There was a four foot swell in some areas so we began to look for a more sheltered area to fish. 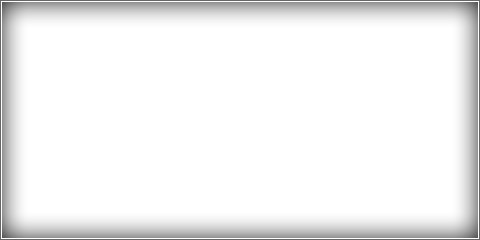 The Skipjack began cooperating and most of the boats had one on. About mid morning an almighty roar came from Rocky Tussey as he landed a nice Tuna near 30 lbs. The celebrating went on until Rocky made sure everyone knew he landed the beauty. The winds picked up later that day and everyone came in a little early. Later that evening we all helped Rocky celebrate by sharing in his sashimi before another great dinner provided by our hosts. On Wednesday morning after breakfast Gary Bulla contacted the lead Captain to determine what the latest seas conditions at the launching location were. Unfortunately the news was not good and it was decided to postpone our fishing for a few hours to see if conditions would improve. About mid morning we decided to have a closer look at the conditions at the launch area for ourselves. When we got there our boat Captains and Gary determined that the sea and wind conditions were would not permit us to fish that day. Gary then decided to give us a tour of the local area and do some sightseeing, after that we finished with a light lunch of margarita’s, guacamole and chips and shrimp ceviche at a restaurant located at the Bay of Dreams complex. The next day, the sea and wind conditions had improved greatly and we were into another great Dorado and Skipjack bite. Everyone had fish on and enjoyed the day; Russ Hampton had a particularly good day by tying into and landing a nice Yellowfin. Needless to say the sashimi would flow again that night. That night Angie made a Chocolate Cake for my Brother Hugh’s sixty fifth birthday and cooked him his favorite Mexican dinner of Chicken Fajita’s. We all helped my brother celebrate his birthday and a good time was had by all. On Friday our final day of fishing, I was paired with Russ Hampton. The sea and wind conditions were perfect. We began fishing near Cerralvo Island where we landed a variety of fish that included Lady Fish, Pargo and Jacks. Later that morning we moved out to deeper water to see what the Tuna were doing. As we approached the rest of the boats in our little group, I could see the Rocky Tussey and my brother were on a double hookup and Lynn Adams was also fighting a nice fish. The Captain positioned our boat about fifty yards from the rest of the group and began chumming. In about five seconds, I was hooked up with what I thought just had to be a Tuna and a few seconds later Russ was also fighting a nice fish. After a few minutes, while still fighting my fish I looked around to see that just about everyone in our fishing party were fighting fish. Doubles all around. Then as we were still fighting our fish the Captain yelled "Dorado" as a large school of Dorado passed the boat. 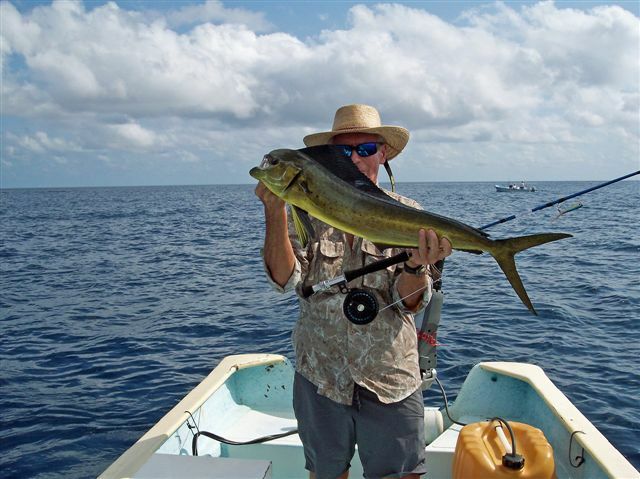 Russ handed the captain his rod and grabbed for his ten weight and began casting at the Dorado. In a matter of seconds, we had a triple hook up. Russ landed the Dorado and then returned to the fish the Captain was holding for him. The Captain returned to chumming to try and hold the Dorado in the area. I was still fighting my fish and making little headway, meanwhile Russ landed a Skipjack over twenty pounds on his fourteen weight and then began looking for the Dorado. They obliged in just a few minutes and Russ using his ten weight cast to one close to the boat but another Skipjack beat the Dorado to Russ’s hook. Russ fought the Skipjack on the surface a few seconds and then the shook him off and began immediately to cast to the Dorado which obligingly stayed in the area. He hooked the Dorado and landed it and then began casting to another nice Dorado that was close to the boat. Sure enough, another Skipjack got his hook so Russ began fighting the Skipjack with his ten weight. After a few minutes he landed the Skipjack and immediately cast to the Dorado who by God was still in the area. He hooked the Dorado and landed him. By this time Russ had the Skipjack to Dorado switch down pat… Meanwhile, I am still fighting my fish, which I landed about five minutes later. It was the largest Skipjack that I had seen, just had to be near thirty pounds. I highly recommend this trip to you. It just can’t miss. I know that Russ Hampton is making plans for another trip with Gary for club members next year in place of the Loreto trip he was initially planning. Keep your eye on the website for additional information on this trip. In summary our group had 3 Yellowfin Tuna (to 30 lbs), 57 Skipjack (to 30 lbs), 63 Dorado (to 15 Lbs), 2 Rooster Fish (to 6 lbs), 17 Ladyfish, 8 Jack Cravelle, 3 Pargo, 4 Green Back Jacks, 1 Flag Cabrilla, 1 Snapper, 1 Sierra, Numerous Needlefish and other smaller fish in many varieties.